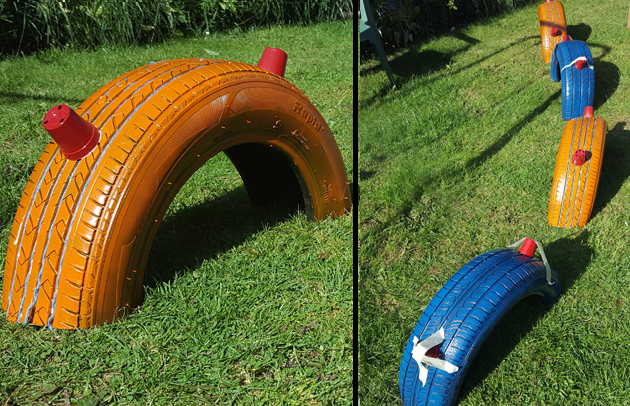 Back in March, I wrote a piece on up-cycling old tyres, and the top 5 projects I'd like to try. Well, I finally finished my dragon! So Reggie is made out of recycled products that we had lying around the house. He's taken a long time to be made but I'm hoping he'll be able to enjoy some summer sun before going away in his cave for the winter... or the garage to you and me. 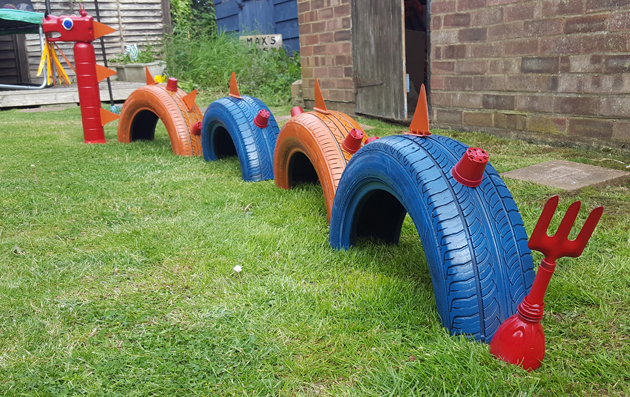 My son has already enjoyed having him in the garden, and he adds a bright and colourful attraction to it, colours that I associate with kids and fun. How did we make him? 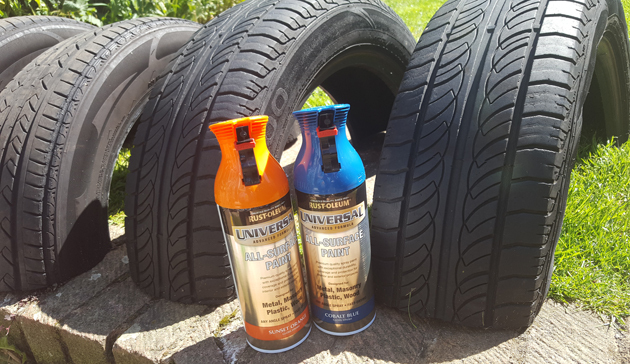 In my mind, we can simply cut tyres.... pfft! Apparently not! 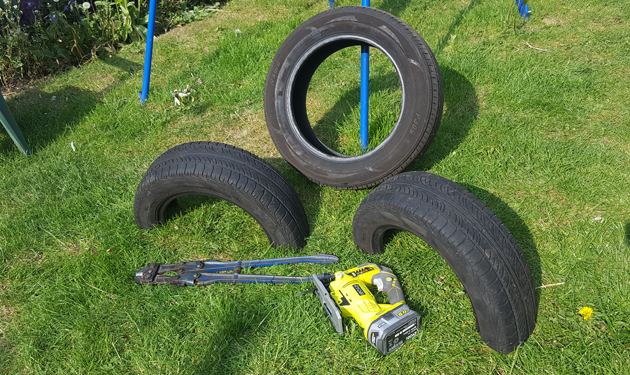 After some sweat and tears and several different tools, both power and hand, we managed to cut 2 tyres in half. The reason why this wasn't just an easy 'cut some rubber in half' was due to the fact tyres have metal in them, and it's the metal that causes the issue. My son chose the colours, I wanted a completely red dragon, but in the eyes of a child the more colours the better so this is why his body is orange and blue. That and it's the colours that we had enough off in the house. His spikes are a mixture of plant pots and a sweet pot lid, but what has amazed me is I used Gorilla glue and it's all stayed on. It's lasted the rain, the night and the birds, and all spikes are still in tack! The neck is made out of lemonade bottles and the head is a milk bottle. 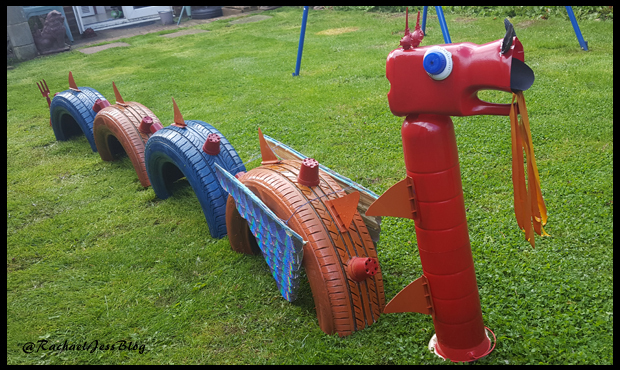 The bottle labels were used as the dragon's fire and the lids were his eyes, so we managed to use all of our bottles for this project. I found some lovely shells for his nostrils and horns and I do believe he turned out rather well! Unfortunately, he's rather delicate and when he toppled over he lost a nostril and some of his paintwork! I've since sprayed with clear lacquer and used more glue, but I've also added sand to the base of the neck to keep him more stable. I added a tail, which doesn't stay out due to the nature of it. A squash bottle holds an old kid's trowel, both of which have been painted to match the head of the dragon. My favourite part of this project was creating the wings. These, unfortunately, I didn't have around the house anymore, I'd given them away a few years ago, so I did have to purchase a pack of CDs for £2 at the car boot! 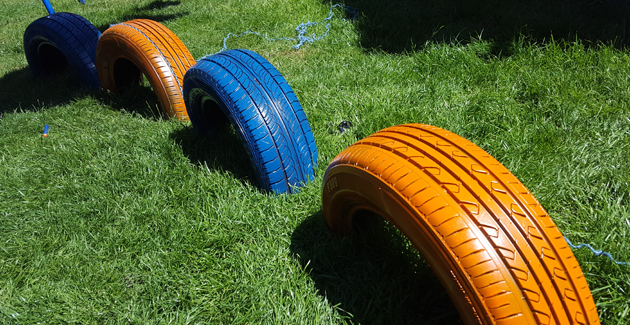 I love the colour effect of these, but like tyres can be a little bit of a 'challenge' to cut. After watching a couple of CDs crack, split and fly across the room, I did some research and it turns out putting a hair dryer (or craft dryer) on the CDs makes for a smooth cut! 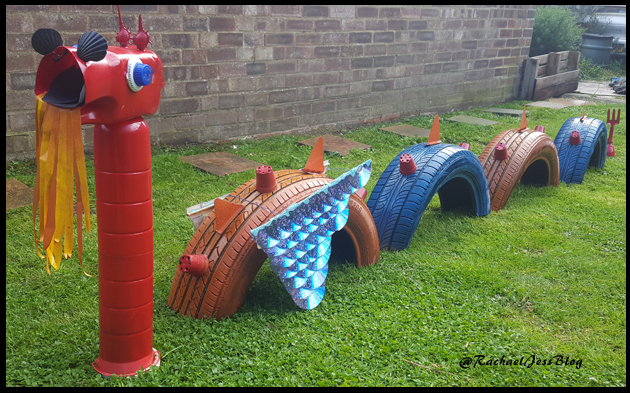 I glued all the pieces together to make it look like scales and then added the wings to the first tyre, so he has baby wings rather than full length - I honestly didn't have the patience to create wings to go across 4 tyres, but wouldn't that have looked fantastic! The day Reggie got his wings was the day it poured down! But I was so pleased that I'd finally finished him I didn't let the rain stop me, and they've stood the test of time too and not one CD piece has come off! So here he is, my recycled dragon ornament for the garden. I'd have him living out the front garden I'm so pleased with him, but he's not safe out there and may... well let's just say ... fly away!